What sort of "earth" can be used? Can you use soil from the site for earth building? If soil is to be used, it must not contain any humus or vegetable matter, so top-soil should be avoided in preference to sub-soil. It is possible to use sub-soil from the actual earth building site or from a site nearby, if it has the correct particle size curve. If local sub-soils do not quite match the curve, they can sometimes be modified and enhanced by the addition of specified amounts of clay, sand or gravel. Crushed Rock for earth building? An alternative approach to earth building, which has become very common in Australia, is to use material from a local quarry. The quarry can mix different screened materials to achieve the ideal particle size curve. Generally these are materials that would otherwise be regarded by the quarry as waste. Consequently it is environmentally beneficial to use this rather than digging fresh sub-soil. It can also have the advantages that it is often available at a good price and can be of consistent quality and colour. Recycling - a Better Alternative? There is yet another alternative that has been investigated and proven by Earth Structures. 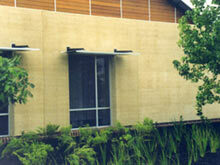 This is the use of recycled building rubble. Bricks, stone and concrete from demolished buildings can be crushed, on site by mobile crushing plants, or at central collection depots, to the particle size curve required. Red bricks and light grey concrete when crushed can combine to make a pale pink sandstone-like material with equal strength and weather resistance to the usual crushed stone. An interesting incidental fact was noted that this material required less stabiliser to be added to the mix due to the cementatious effect of pozzolanic material in the building rubble. This is surely an ideal material to use from an environmental aspect. 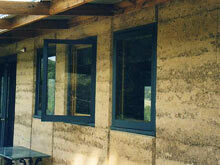 See Recycled Building in the Image Gallery. Most experienced earth builders are able to recognise whether a sub-soil or crushed material has the right characteristics. However it is wise to have a new material tested in a soil laboratory to determine the particle size curve. The laboratory can also test the proposed mix when it has been stabilised and compacted to determine the compressive strength that will be achieved. The colour of finished earth buildings will depend upon the colour of the earth used and also according to whether grey or white cement is added. White cement will brighten and lighten the wall colour and is generally preferred for pale coloured earths, whereas grey cement will give a softer and more discrete final colour. The texture of the finished walls of the earth building can be determined by varying the maximum gravel size and the compaction technique. Smooth walls with a fine granular finish are possible with a fine screened mix, or, by using a coarser mix, the wall finishof the earth building can be made rougher and more rustic in appearance.